For the second year in a row, Atlanta-based space music composer Jonn Serrie will perform a live concert at Fernbank Science Center to mark the holiday season. The concert, titled “Upon a Midnight Clear,” features Serrie’s ethereal settings of holiday classics, accompanied by a star show on the Science Center’s Zeiss star projector. “We were so tickled when Jonn agreed to come again this year!” says Fernbank Science Center Astronomer April Whitt. “Last year’s show was a big success, but getting an artist of Mr. Serrie’s stature to play at Fernbank isn’t a gimme.” Serrie, who calls Atlanta home, is one of today’s preeminent composers of music for planetaria as well as space-themed special events, having worked on projects for NASA, the U.S. Navy, Lucasfilm and CNN. 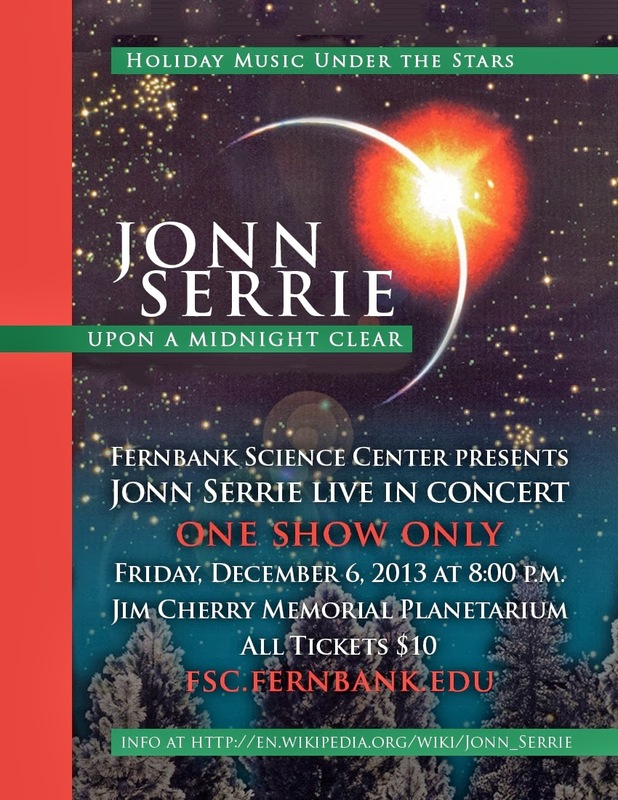 Serrie’s December 6th show headlines a series of special programs at Fernbank Science Center this December. The following Friday, December 13th, will see a special set of planetarium showings to culminate the Center’s donation drives for both Atlanta Community Food Bank and Toys for Tots. That evening, a donation for either cause will serve as your planetarium ticket. On December 20th, to mark the end of the semester and winter solstice, the Science Center presents “Stories Under the Stars of Winter; Celebrating the Winter Solstice.” The program explores winter constellations, and includes storytelling by Fernbank’s own April Whitt. Admission to the program is one new teddy bear (or other new stuffed animal), $5.00 value or greater, per person, which will be donated to the children at Children’s Healthcare of Atlanta at Egleston. Tickets for Jonn Serrie’s concert, and information on the other programs, are available on the Science Center’s website, fsc.fernbank.edu.